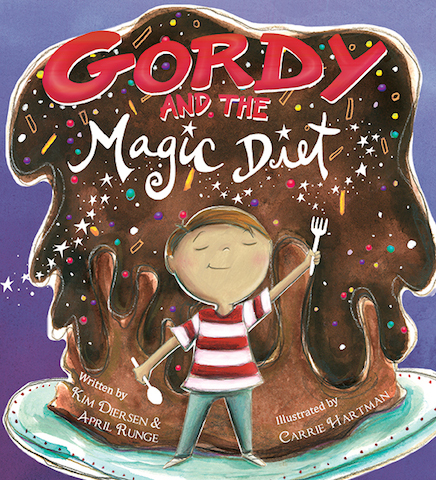 I bought this book during an author meet-and-greet with April Runge in late 2013, and though I had read about Gordy and the Magic Diet by Kim Diersen & April Runge (illustrated by Carrie Hartman), I had been skeptical to check it out. It can be hard in children’s books to navigate something being “magic” without seeming condescending or inaccurate. This book actually does a fantastic job of explaining a concept to children without leaving anyone out with a particular example, which is where the “magic” element comes in. I don’t think magic is a stand-in for science here, it is just a variable for kids to fill in their own unique restrictive diet circumstance. Gordy experiences discomfort when he eats certain foods, and though he is tempted (and gives in at one point), he faces his greatest challenge on Halloween. He misses the candy and treats of days gone by but as the reader already knows, if Gordy eats the offending food(s), he will be sad and in pain. The notes at the end of the book feature each of the book’s contributors sharing what their “monsters” are – and what they avoid as a result. Kim Diersen’s son avoids gluten and artificial foods. April Runge’s daughter had a diagnosis of catastrophic pediatric epilepsy that subjected her to substantial medications until the ketogenic diet lent assistance. And Carrie Hartman, the illustrator, has one daughter that cannot have gluten while the other avoids preservatives. Getting that window into their unique circumstances highlights the need for a book such as this to explain to children that whatever “monster” is making their relationship with food and themselves difficult, if a special diet is what the doctor ordered, they too can be brave and stick with it like Gordy. Every day after, Gordy fought his Monster. Except some days were harder than others. For instance, on Christmas, when cookies showed up at every party, on Valentine’s Day, when candy hearts appeared everywhere and on Easter, when every Easter basket, except his, held chocolate bunnies. Still, Gordy was absolutely, positively certain that his Monster would stay quiet now… thanks to his Magic Diet. Vegetarian and vegan families that are ethics-based in their dietary and lifestyle choices will still find something useful here, not just in having compassion for people on restrictive diets, but also because Gordy must navigate food based holidays just as veg families do. In one illustration, Gordy is eating what looks like steak for dinner and he remarks that his meal “smells like dirty socks,” most likely referring to the steamed broccoli on his fork. It makes sense to include that because many kids would have that reaction to a new way of eating, but in the book Gordy not only gets used to his food, he embraces feeling well wholeheartedly. Certainly a special book for a special audience, but thoughtfully written and beautifully illustrated. My kids really enjoy the story at ages 4 and 6.